"A Champagne from the best plots of land from the Bonnaire House". This Champagne is made with a single grape variety : Chardonnay 100% Blanc de Blancs, and is a blend of wines from the Cramant Grand Cru, exclusively. The wines in this blend are from several harvests. All these wines are from the best plots from the Bonnaire House, in the town of Cramant, which is classified Grand Cru. The wine is then bottled and laid on laths and under cork in cellars for at least 5 years. The colour is a shimmering gold with a few copper shades. The nose is very floral with scents of white flowers. The taste begins with citruses like Menton lemon or Corsica tangerine, to end on a prevalence of jammy fruits like Mirabelle plum, prune, or apricot with undertones of Echiray butter, brioche, and toasted bread. To be served around 10°C with smoked salmon, foie gras, or Auvergne smoked trout canapés, or with baked fishes like bass or cod fillets, or even with white meats or a rack of lamb. 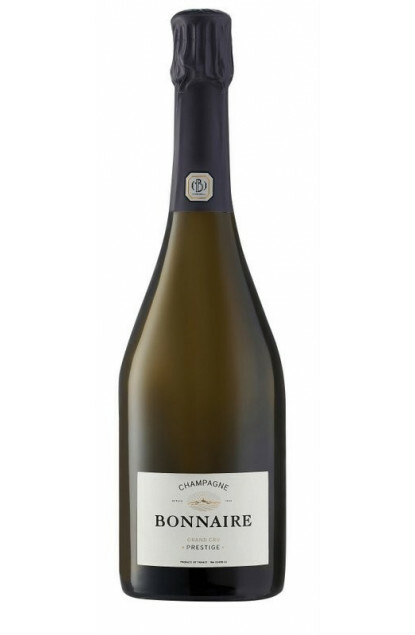 Since 1932, Bonnaire Champagne whose vineyard is located in Cramant, a village that is classified Grand Cru from the Côte des Blancs, elaborates its Champagne. The vineyard has long been property of the Bouquemont family and it was right after the second World War that André Bonnaire, by marriage, inherited the vineyard, which spreads today on around 25 hectares. The Bonnaire have also been a family of winegrowers for several generations. Jean-Louis Bonnaire, with help from his two sons Jean-Etienne and Jean-Emmanuel currently manages this Grand Cru Cramant House, located in the heart of the Champagne region.